Yarra Valley Water is replacing an existing water storage tank in the Healesville area to ensure the reliability of our water supply to our customers. Throughout Yarra Valley Water’s service district, drinking water is stored in reservoirs located on hills and other high points, and then flows through pipes by gravity to supply nearby customers. 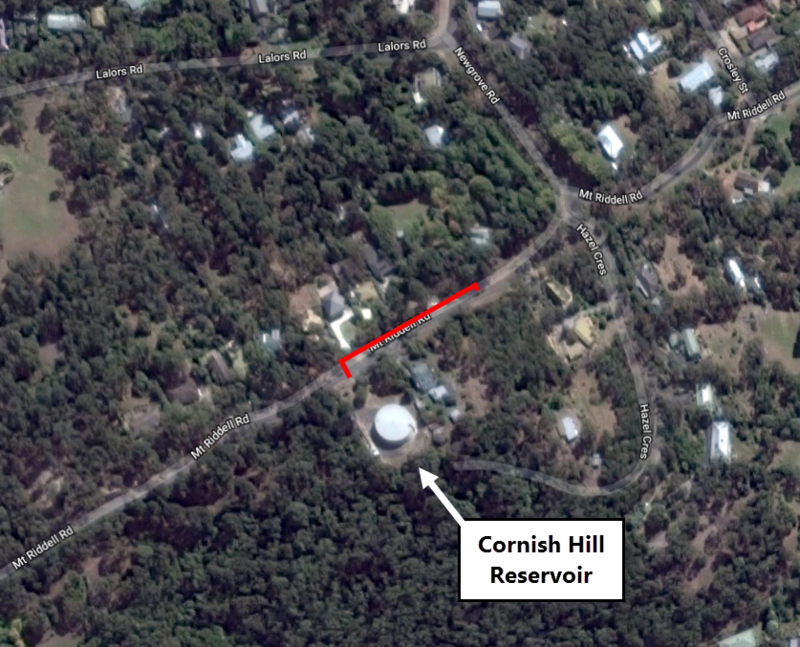 The water storage tank located on the top of the hill on Mt Riddell Road is known as the Cornish Hill Reservoir, and it has been supplying customers in the area since 1964. The Cornish Hill Reservoir is a vital piece of water infrastructure, however due to its age the time has come for the tank to be replaced. In late 2017, Yarra Valley Water completed some minor preparatory works around the Cornish Hill Reservoir. Our contractors, AHA Constructions and Brockman Engineering, are undertaking the works on our behalf. Project works started in January 2018. In March, our pipe contractor, AHA Constructions, finished constructing a new 230-metre-long section of water pipe in Mount Riddell Road. In late October, our tank contractor, Brockman Engineering, will finish constructing the new 2.5-million-litre tank in the same location as the previous tank. Between October and January, Brockman Engineering will be performing various site activities to finish off the tank including welding, painting the tank, electrical works, and completing a new vehicle access driveway within the tank site. Works will occur between 7.00am to 6.00pm, Monday to Friday. Saturday work will occur from 8.00am to 3.00pm to ensure we can complete these important works before the next summer season, when drinking water supply is in higher demand. Works will not occur on Total Fire Ban days. Local water and sewerage services will not be affected by these works. People in Healesville will continue to receive the same water quality at the same water pressure levels. A Council-approved traffic management plan will be in effect throughout the works as some construction activities will occur within Mt Riddell Road itself, between Hazel Crescent and Blumfield Road. The plan considers these works occurring in a narrow roadway during the peak fire season, and it will ensure the ability of residents and our workers to enter and exit the area as needed. The works that made the most noise have been completed. The remaining works are now quieter, including noise from equipment such as occasional safety beeping, and vehicle engines. To protect the environment, most of our pipe construction works were completed using trenchless technology, where we drill a hole and push the pipe into that hole, instead of having to dig a long trench to lay the pipe in. This method is used in environmentally sensitive areas. When the works have been completed, our contractors will clean up and reinstate affected areas. This includes fixing up road surfaces and nature strips. We will also be planting some new trees over the next winter planting period, to help screen the tank from its neighbours.